Soulja Boy Actually Gives a Great Interview! Explains All The Details Regarding him and Rihanna and says That’s Why Chris Brown is Really Mad! (VIDEO) - T.V.S.T. 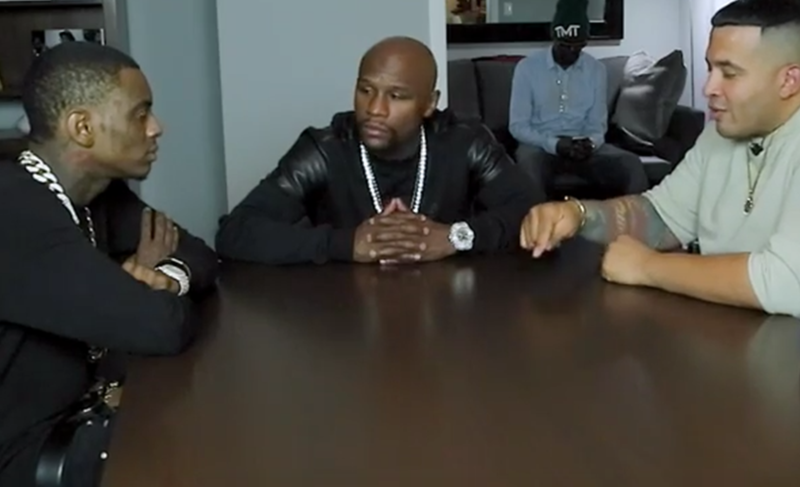 Kudos to Hollywood Unlocked for being able to get Soulja Boy and Mayweather to sit down and have a 32 minute discussion. In case you were wondering if Jason Lee had legit contacts, this basically confirms that he does. However, don’t be too impressed, let’s not forget that he and Soulja Boy were both on LHH so the impressive feat was getting to sit across the table from Floyd. Jason basically had Souja Boy walk him through all the beef that has been happening lately, explain his actual gang affiliation and talk about next steps to actually fighting Chris Brown. The most revealing part of the whole interview is when Soulja talk about the night that Chris Brown beat Rihanna and how Rihanna contacted and hung out with Soulja Boy after. I have to admit…the entire interview is pretty damn entertaining. The best part is Mayweather’s face while Soula Boy’s talking, especially when he says that he’s a blood. Say Whaaat? Over 15 People Arrested In France For The Kim Kardashian Robbery, Get All The Details Inside!